Beautiful Costa Rica Condo only 2 minutes from Pacific Ocean! This 860sqft 2 bed 2 bath fully furnished Costa Rica condo features appliances, AC, custom built cabinets, washer, dryer, cable TV, Internet access and lots of storage. This peaceful Costa Rica condo is just minutes from Playa Ocotal, one of the most beautiful beaches in Costa Rica. Community amenities include full use of several pool areas, parking and 24/7 security. This beautiful Costa Rica villa is a first level condo and conveniently located steps from the pool. Playa Coco and Playa Ocotal is located near incredible nightlife, national parks, volcanoes, waterfalls, beaches and some of the best diving and fishing in the country. And the best thing it is only 20 minutes door to door to the Liberia International Airport in the Guanacaste region. This Costa Rica condo is the perfect home away from home. This condominium is in the Villa La Colina #8035 development in Ocotal, Costa Rica. Great rental management company! : We work with an excellent property management company and will help with EVERYTHING from getting keys, helping out with sightseeing tours and offering dinner recommendations. Consider them to be your personal concierge! SECURE COMPLEX - The association has hired a wonderful security company and there are security guards securing the grounds 24 hours a day/ 7 days a week. Friendly Neighbors! : Most of Villa LaColinas owners are from the US or Canada. Some are retired, while others are in their 30s that have bought as an investment property. Some live in Costa Rica year round, but most owners spend some or all of the winters enjoying the tropical Costa Rica weather. There is a sense of community so people look out for you and help you with friendly advice about Costa Rica travel tips!! We are the original owners of this great Costa Rica condo. We love Costa Rica and come down as much as possible. 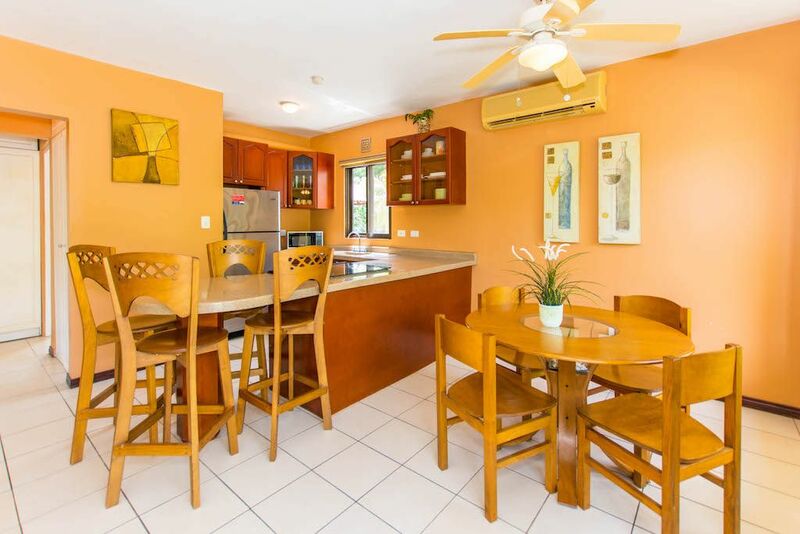 This Costa Rica condo is fully equipped and ready for you to enjoy your next trip. Villa Lacolina is a tropical paradise in which you can get a truly memorable vacation. It is common to wake up to Howler monkeys and see beautiful birds and Costa Rica wildlife . The landscaping is beautiful and filled with Costa Rica flowers. There are 10 pool areas around the complex so there are lots of swimming and lounging options. The condo is located in the tranquility of the hills and on the other side of the hill is beautiful Ocotal beach. Condo has full kitchen and comes completely furnished and can be lived in year-round. Beautiful ,clean , well equipped condo.Loved the pool and location. Very quiet area. Jennifer was very friendly and helpful as was Bernie,the property manager. Everyone was so friendly.We would definitely return. Very clean and pleasant place. Tito, the property manager, was fantastic. Great fishing and attractions close to condo. We will definitely return. Thanks Rosemary and Gary! Thanks for the rental and please keep in touch! Nice building, good views. Only needs a new TV and we would rent it again. We just ordered a new flat screen TV and will be replaced next week. Thanks for letting us know! I stayed there for a week with my family (3 kids) and we all enjoyed a lot. This is a beautiful and peaceful and clean place. The condo has everything and more you need to have a perfect stay. A lot of electric appliances, dishes, towels, and even a laundry machine. WIFI was fine also. I also liked to have separate bathrooms for the kids. The pool was just steps away from the door, and there is also a bigger pool at a short walk distance. There is a small porch where you can sit and relax. We visited a different beach every day. My older son was really happy snorkeling, watching sea stars and fishes. There are a lot of nice beaches near and also a lot of restaurants specially at Coco Beach to go. (We went by car to the beaches). There are also supermarkets and everything we needed. If you want to relax, and a peaceful stay at a unbeatable cost, this is definitively your place to go. I will definitively go back again. Condo is located in Playa del Coco / Playa Ocotal area and takes 10 minutes to walk to the Pacific ocean!. This Costa Rica condo is located 20 miles west of the Liberia International airport. You can be off the plane and to the condo within 30 minutes! This Playa Ocotal condo is fully equipped and can be your home away from home. Convenient location to shopping, beaches and activities. Golf: There are a few nearby golf courses.